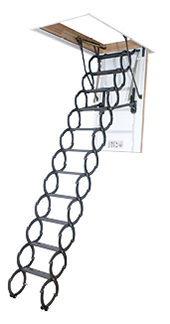 One of the first factors to consider when choosing an attic ladder is the rough opening. FAKRO attic ladders are available in various rough opening dimensions and can be retrofit to existing openings or accommodate a new build. An existing rough opening that does not fit the attic ladder’s rough opening can be framed to accommodate the attic ladder. The second factor to consider is the ceiling height. Each attic ladder’s rough opening dimension has a ceiling height ranging from the minimum compatible ceiling height to the maximum ceiling height. 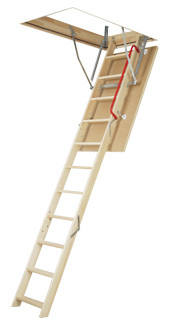 The attic ladder is suitable for a ceiling height within this range by cutting the ladder, removing or adding steps, as well as making the necessary adjustments outlined in the instructions. The third factor to consider is the insulation (R-value). All FAKRO attic ladders with an insulation value have a seal, the lid (door) is made from solid redwood pine with either a white finished lid or paintable HDF finish, and hardware is fully concealed when installed. Fire-rated models are also insulated and sealed. Non-insulated models have a paintable particleboard lid and are suitable for areas where an insulated attic ladder is not required. When choosing an attic ladder also consider the weight-load capacity rating. 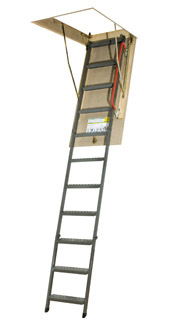 FAKRO attic ladders are rated according to ANSI standards. Look for the ANSI symbol for certified models.